Turn off the water while brushing your teeth. 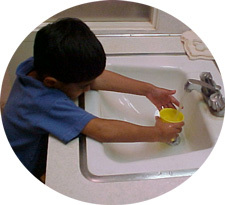 An open tap releases 3 gallons of water per minute. Before brushing, wet your brush, and fill a tumbler to rinse your mouth. Savings: 3 gallons per minute. Turn off the water while shaving. Fill a small container or the bottom of the sink with a few inches of water to rinse your razor. Savings: 3 gallons per minute. Make every flush count. The toilet is the biggest water user in the house, taking up to 5 gallons of water with every flush. Don't use the toilet as an ashtray or wastebasket. Savings: 3.5 to 5 gallons per flush. Check bathroom faucets and pipes for leaks. Savings: 1/5 gallon per minute, or 8,640 gallons per month. Keep tub baths to a minimum. Bathe in a partially-filled tub (minimal water level at 12 gallons). Savings: 24 gallons. Put a plastic container or toilet dam in your tank to reduce flush water. Place a plastic quart bottle filled with water in the tank safely away from the operating mechanism. This will displace some of the space normally taken by water, yet still allow normal flushing. Savings: 0.25 gallons per flush. Check your toilet for leaks. Put a few drops of food coloring in your toilet tank. If the coloring appears in the toilet bowl without flushing, you have a wasteful leak that should be repaired at once. Savings: Possibly hundreds of gallons. Install water-saving shower heads or flow restrictors. Inexpensive shower heads and flow restrictors are available at the hardware store and are easy to install. These still allow cleansing, refreshing showers. 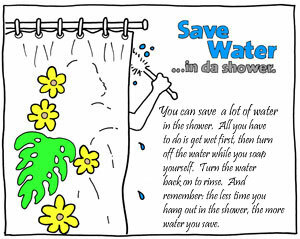 Savings: up to 75% per shower. Take shorter showers. Limit your showers to the time it takes to wet yourself and rinse off. Savings: 21 gallons.